Haroula is a beautiful, bubbly lady working in the heart of Bondi. Haroula came to us after experiencing some disappointing dental work from overseas. After putting her trust in Dr Caroline, a plan was put into place to transform her smile. Haroula’s overall treatment was completed in 6 visits. In order to spread out the payments, we accommodated to Haroula’s wishes and completed her treatment over a longer period of time. 1st Visit: Consultation with Dr Caroline. Photo taking and a mock up was made so patient can see how the treatment will look when finished. 4th Visit: RCT 3rd stage, Teeth preparation of porcelain veneers and impressions were taken. We carefully created the smile in order to enhance the personality and characteristics of the patient as well as to bring out the femininity. 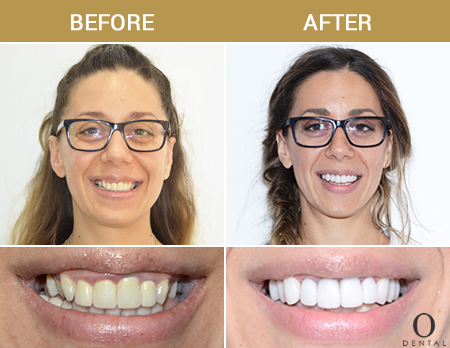 Cosmetic work at times, if it is not done carefully, can result in the loss of one’s unique features or make a person look more mature than who he/she really is.This stunning result is from making the gum line more uniform as well as placing lighter coloured porcelain veneers to accentuate her smile. Dr. Caroline Oh carefully designed the process to enhance the femininity and unique features she already has. This patient also went through a total transformation of herself by eating healthy and exercising at the same time! We are so proud of her!